Engineers are usually the ones managing these activities. Marketers, even those with technical chops, tend to shy away from it. One of these activities is an HTTP request, and it’s actually not as complicated as you might think. In fact, marketers need to have at least a general understanding of the actions their own website performs each time a person visits it. So, what exactly is an HTTP request? How does it affect the user experience? And what can a marketer do to reduce their website’s HTTP requests? Let’s go through each of these questions one by one. By the end, you’ll have a better grasp on why these response protocols matter, and what you can do to give your website visitors a better, faster experience. HTTP requests happen when a web browser sends a “request” to your website’s server for information on a webpage. When a user visits a page on your website, your server heeds this request and returns the files contained on that page to the user’s browser. The fewer HTTP requests a website has to make, the faster the site can load. The person’s web browser (popular browsers include Chrome, Firefox, and Safari) sends a request to your web server. Your server hosts the webpage they’re trying to visit on your site. Once the person’s browser receives this file, it begins to render your website on the person’s computer screen or mobile device. The above steps describe a single HTTP request, from ask to answer. HTTP stands for “Hypertext Transfer Protocol,” which is just a fancy name for a web browser sending a request for a file, and the server sending (or “transferring”) that file to the browser. There are two reasons HTTP requests can affect your website’s user experience: the number of files being requested and the size of the files being transferred. A web browser needs to make a separate HTTP request for every single file on your website. If your website doesn’t have many files, it won’t take very long to request and download the content on your site. But most good websites do have a lot of files. The more files on your website, the more HTTP requests your user’s browser will need to make. The more HTTP requests a browser makes, the longer your site takes to load. The size of the file being transferred is also a factor in how long a page may take to load on a user’s screen. And just as the files on your computer have various file sizes — measured in bytes (B), kilobytes (KB), megabytes (MB), and so on — so too do the files embedded on your webpage. Big, high-definition images are a common culprit of large file sizes. In other words, the larger or higher definition the content is on your website, the larger its file size is. The larger the file size, the longer it will take to transfer it from your server to a user’s browser. The longer this file is it transit, the longer a user’s browser has to wait before it renders this content on his/her screen. 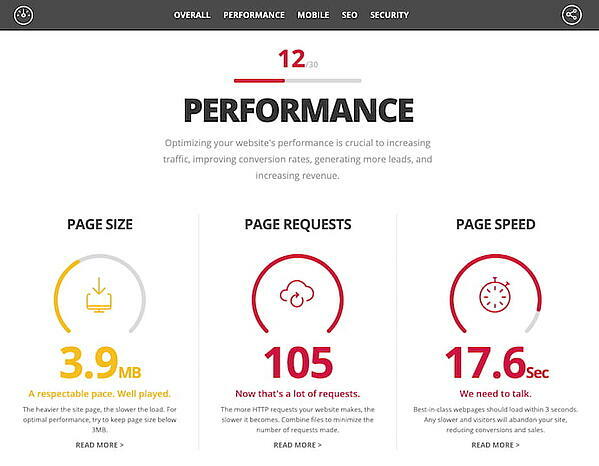 And research shows load time matters when it comes to website performance. According to data from Pingdom, a website performance monitor, a page’s bounce rate can soar from 9% to a whopping 38% if its page load time increases from just 2 seconds to 5 seconds. This is because lots more people “bounce” from your website during that three-second delay. Although there isn’t necessarily an optimal number of files your webpage should be reduced to, HubSpot’s principal product marketing manager Jeffrey Vocell suggests aiming for between 10–30 files. 1. Grade your website’s performance to find the root problem. If you’re starting from scratch, with no idea how your website is performing, you’ll first want a detailed report of your website’s overall health. To get this report, check out HubSpot’s Website Grader. Using Website Grader, simply enter your email address and the URL of the webpage you want to audit. You’ll receive a free, personalized report that grades your site on key metrics including mobile readiness, SEO, your page’s total file size, and of course, how many HTTP requests the page is receiving. This grader can help you diagnose the precise issue you suspect your website is having. For example, if you have a low number of page requests, but a high page size, your goal should be to reduce the size of the media on your website — not necessarily to reduce the amount of HTTP requests you’re requiring browsers to make. Once you have an idea of how “big” your webpage is, and how many page requests it’s requiring, use Google Chrome’s Network panel to drill down into these numbers. This tool makes it easy for anyone to check what’s on your page, how many HTTP requests the page makes, and what file is taking the longest to load. First, this tool shows you all the files a browser had to request and transfer in order to download the page — and it also shows a timeline of when this happened. For example, Google Chrome’s API can tell you precisely when the HTTP request for an image started, and when the image’s final byte was received. 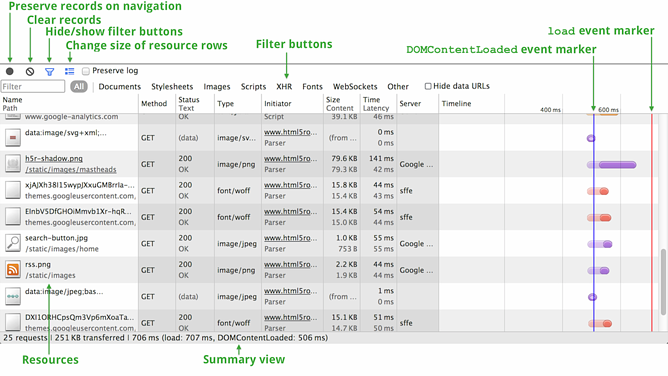 It’s a really helpful way of seeing what’s on your page and what’s taking a long time to load. Curious how many requests your website requires? The Network panel will tell you that, too. Take a look at the very bottom left of the screenshot above and you’ll see the total number of requests; in this case, it’s 25 requests. Images are a valuable webpage asset because they make for a strong visual experience on your webpages. However, if you have images on your page that aren’t contributing much value, it’s best to just cut them out altogether — especially the ones that are really large. Keep in mind you can always reduce the file size of your images further before uploading them into your website. If you have a webpage with many separate images on it, for instance, it’ll behoove you to reduce their file sizes as much as you can before publishing the page. If possible, we recommend reducing each image’s file size to less than 100 KB. Depending on the image, you might need to compromise on this minimum, and that’s alright. Just try your best to keep your individual files from entering megabytes (“MB”) territory. To compress your images to their minimum, use a tool like Squoosh, a tool developed by Google to shrink image file sizes at the slight expense of image quality. The more you shrink the file size, the lower the image quality can get — use Squoosh’s sliding compressor meter to strike a balance between quality and size that suits you. Cutting and compressing images are a great first step to reducing HTTP requests and page load time. But what else did you see on the Network panel that’s adding requests? For example, you might find that a video or Twitter integration adds an entire second or two to your load time. That’s good to know. From there, you and your team can decide whether those assets are worth keeping. CSS code can be anywhere on your site or in any number of files, and it’ll still works just as well. In fact, often the only reason a site has multiple CSS files in the first place is because the site’s designer found it easier to work with separate files. To learn more about combining CSS files, take a look at this front-end website performance guide.